A bit more than a month ago my friend Tony invited me to help with the fungi portion of the 2014 Ontario Bioblitz. "Bioblitz?" I said. "What the heck is a Bioblitz?" Rhytism americanum, a tar spot that attacks native maples. A Bioblitz, it turns out, is a pretty cool event. It's an intense 24-hour study of a specific area's flora and fauna during which professional biologists lead teams that document all the living things they can find. It's essentially an exercise that highlights biodiversity. Though ornithologists and entomologists worked through the night looking for owls and moths and other nocturnal critters, since I was working with the fungi team, led by Jean-Marc Moncalvo, Senior Curator of Mycology at the Royal Ontario Museum, and fungi don't move around a lot, we didn't have to forgo sleep and focussed on collecting samples when they were visible—during daylight hours. we only found a dried up one from the previous fall. Bioblitzes are a perfect introduction to citizen science, since the public is usually encouraged to help. This year's May 25 event was focussed on the Humber River Watershed. There were lots of activities, including guided walks with professional biologists, batbox-making workshops, and field-sketching workshops. But the main event was documenting species, and the main event was wonderfully successful. From the 24-hour period, a total of 1,563 species have been identified so far, including 109 arachnids, 121 birds, 27 fish, 500 insects, 100 non-insect invertebrates, 18 reptiles, 94 lichens, 21 mammals, 78 mosses, 450 plants, and 45 fungi. That's a millimetre rule behind these fuzz-covered Lasiosphaeria ovina. 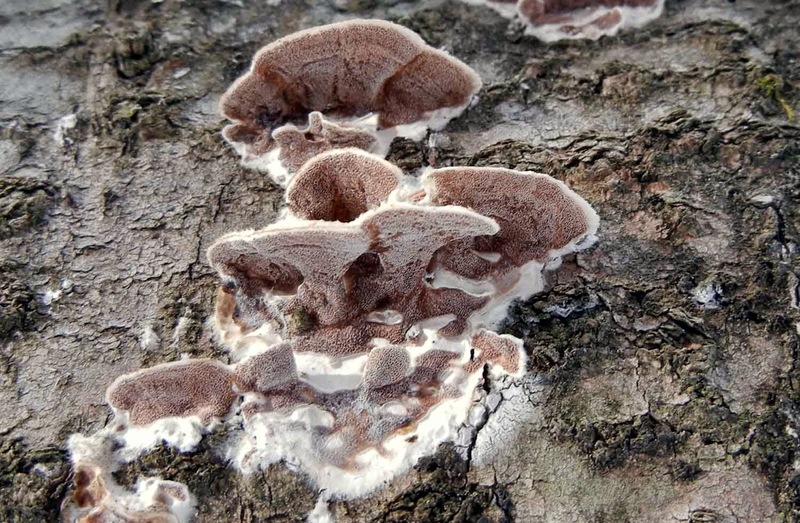 The fungi numbers were low—we only found about half the number of species documented on each of the first two Ontario Bioblitzes in 2012 and 2013, but we have an excuse: May 25 is never a prime fungi-finding time, on top of which there'd been almost no rain for two weeks. 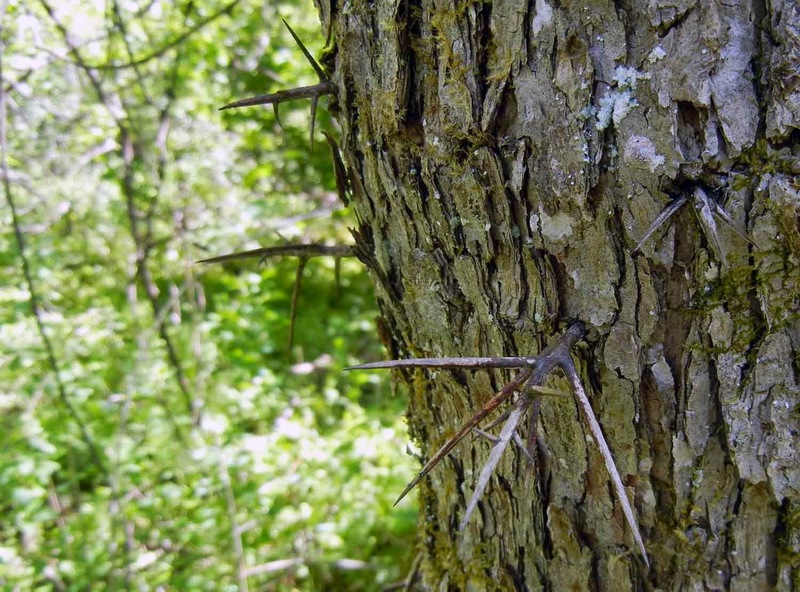 The honey locusts growing in our Bioblitz fungi-hunting area were treacherous! Undeterred, Tony and I explored a scrubby woods not far from the McMichael Gallery parking lot. It was so dry that, at first glance, it looked as if we weren't going to find anything at all other than a few gnarly, desiccated, insect-ravaged tree-growing fungi from the previous fall (they still counted, though!). But once we got down on our hands and knees, (and wiped off the blood from being stabbed by the wicked thorns of honey locust trees), and started turning over fallen branches, we found a few interesting specimens. Admittedly most of these were tiny interesting specimens, but they included some exquisite, snow white, mini stemmed cups bejewelled with dew, and a quite beautiful parasitic rust fungus (featured in my fungi blog post, here), as well as a single, charismatic, and delectable, morel. of these half-millimeter beauties, Lachnum subvirgineum. It was fun. It's always fun looking for fungi. It's like a treasure hunt. So I was delighted to get an invitation to attend another Bioblitz. This one is at the Alderville First Nation Black Oak Savanna, located southeast of Rice Lake. The savanna is very special place, Canada's easternmost prairie habitat and one of the most endangered plant communities in Ontario, where the primary goal is to restore land that has previously been used for agriculture by planting and nurturing native tall-grass prairie species. Because there are a number of species at risk at the Alderville Black Oak Savanna site, this Bioblitz is not geared towards the public's participation in the same way that the much larger Ontario Bioblitz is, but if you'd like to visit the site you can book a tour by calling 905-352-1008. They also have programs and resources for schools, as well as an annual eco-friendly "Prairie Day," which, this year, is on Saturday, September 10. 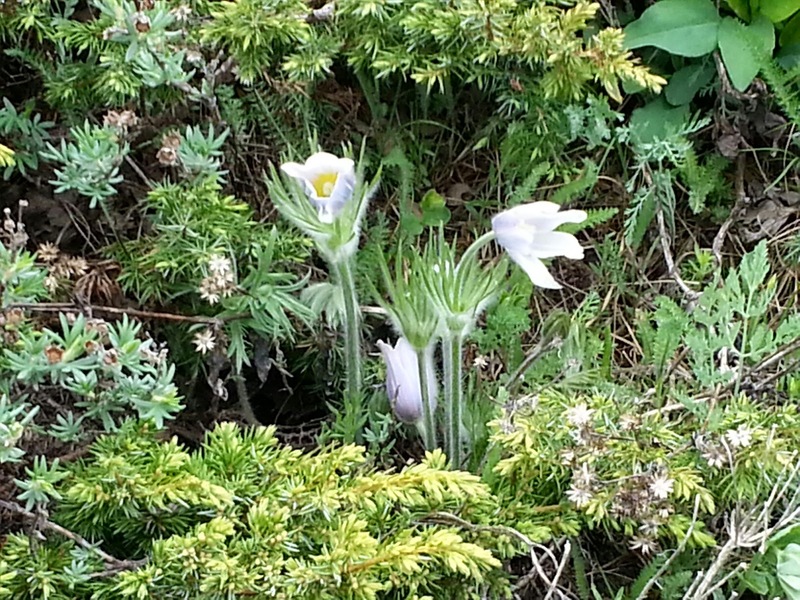 *You can read about a few interesting things we found during the Alderville Bioblitz on my Weird & Wonderful Wild Mushrooms blog. 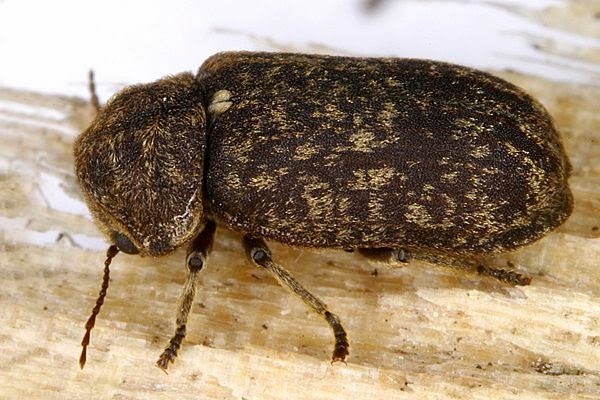 The deathwatch beetle, which hits its head against wood to call for a mate. One candidate for the cause of the sounds she was hearing was the deathwatch beetle, a small insect with a hard head that burrows into wood beams. The beetle knocks on wood to attract mates, making a noise that sounds a little bit like a miniature woodpecker. People don’t want deathwatch beetles in their houses, because when the larvae burrow/eat their way into wood beams they leave tunnels behind. The tunnels weaken the beam and can cause structural damage. I went to this woman’s house looking for another kind of insect, however. I was looking for Psocoptera, a group of tiny insects otherwise known as bark and book lice, or barkflies. 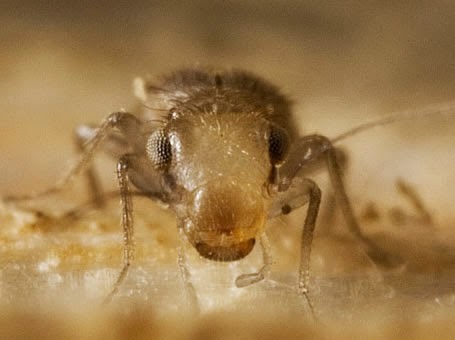 Measuring from 1 to 2 millimetres in length, these obscure creatures are not lice at all, but rather distant cousins. They have long antennae, and many species lack wings. They feed on tiny bits of this and that: algae, crumbs of other insect carcasses, and fungal spores. They do not bite anything, and frankly, they can seem rather boring. 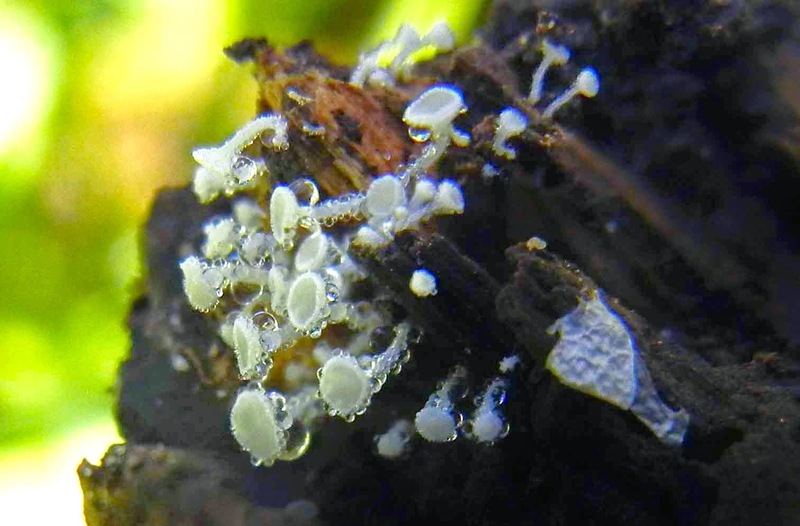 You might find them on logs and tree trunks, the undersides of mushrooms, or other damp places – if you look closely enough. But, they are easy to ignore, and largely go unnoticed. Trogium pulsatorium, whose mating call sounds like the ticking of a clock. Some book and bark lice have a remarkable habit: they ‘sing’. 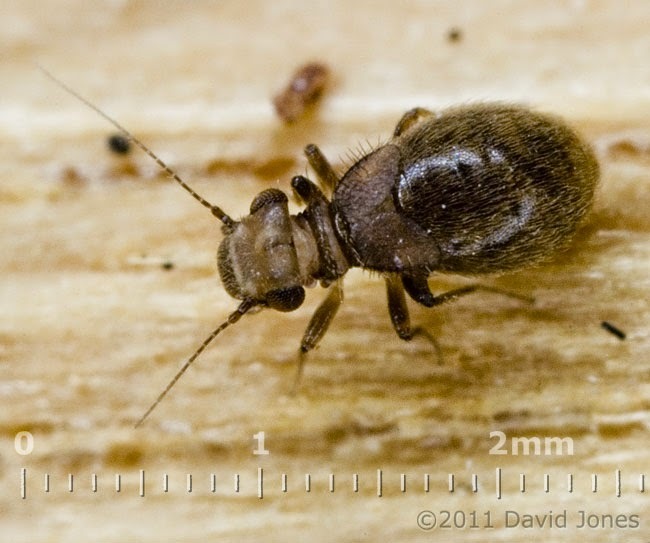 One species, Trogium pulsatorium, creamy white from head to toe and small enough to fit on the end of a pin, produces a noise that sounds exactly like the ticking of a clock. I'm inclined to think this creature is the original deathwatch, rather than the woodpecker-like beetle. The death watch was a sound in people's houses that terrorized Medieval Britain. The ghostly ticking of a clock was thought to mark the final hours of someone in the household. The female bark louse makes this ticking noise by vibrating its abdomen. Like the noise of the deathwatch beetle, it is a mating call. Lepinotus patruelis female, who 'sings' to attract mates by vibrating her abdomen. Another singing barklouse, Lepinotus patruelis, is slightly more colourful. Females are dark brown, and nearly 2 mm in length, so their rear ends might dangle off the head of a pin. The males are smaller and golden brown. In this species, when males vibrate their abdomens, they make a sound like a quacking duck. Quack, quack, quack – four to six times. They do this several times a minute when calling for a mate. When females vibrate their abdomens, they make a series of clicks like dragging a fingernail across the teeth of a comb. The ‘songs’ are used by both males and females to attract mates. Both sexes, especially females, keep singing when a mate draws near. And females seem to compete with each other, just like male crickets do, by singing at each other in the presence of a male. To hear these noises in the laboratory, I used a listening device, a sound magnifier, sold at a local electronics shop. The insects are pretty tiny, so it is not surprising that their sounds are not audible to the naked ear. If, or how, the Bavarian woman could hear these insects added to the mystery. I searched out places in her main rooms where these bark lice might hide. In the kitchen, around the counter there were lots of bread crumbs and some mold spores in the corners of the window sill. In the living room, there were plenty of tropical house plants, and the air was warm and moist. Perfect conditions for these insects: damp with lots of food. As I sat on the sofa with a cup of tea in hand, I heard the sound of a fingernail running across a comb. I listened and heard it again. It was a female Lepinotus patruelis, calling to attract a mate. And I could hear it loud and clear! I followed the persistent noises to a large tropical plant in the corner, and began searching among the leaves. I found her nestled in the crux of a large, curved leaf – she had found a natural amplifier and was using it to broadcast her song to the whole room. This feat, of finding an amplifier to broadcast their sound makes these bark lice the smallest known creature to make an audible noise (to my knowledge). But this broadcasting skill is not the only unusual feature of the singing behaviour. It is also highly unusual for females of any species to be the ones calling for mates, let alone competing in 'singing competitions.' But that is another story, for another blog. Wearing, J. (1996) Reproductive biology of Lepinotus patruelis (Psocoptera): Implications for courtship theory. (Unpublished doctoral dissertation) University of Oxford, UK. By Claire Eamer. Photos by Juanita Bawagan. The Canadian Science Writers' Association (CSWA) handed out its top awards at its recent annual meeting in Toronto, and Sci/Why folk were front and centre. Vancouver-based Sci/Why blogger Shar Levine and her writing partner, Leslie Johnstone, won the Association's Science in Society Youth Book Award for Dirty Science: 25 Experiments with Soil, published by Scholastic. You can peek inside the book here. 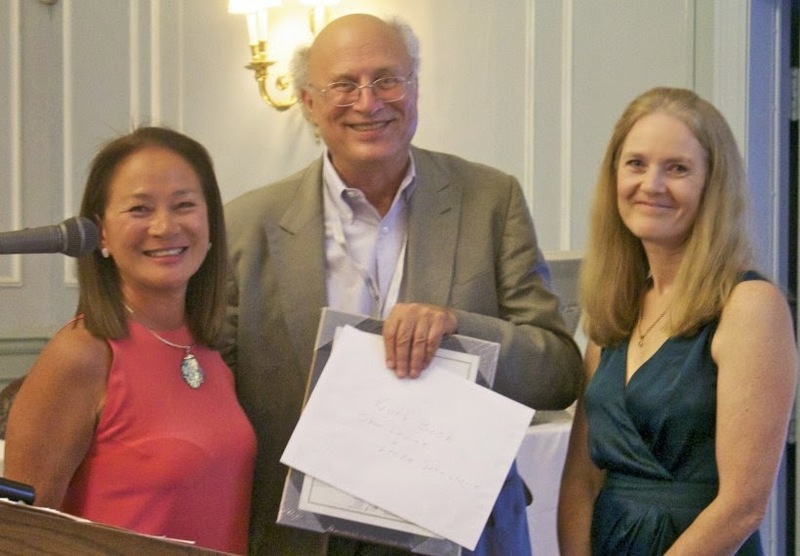 Shar Levine (l) and Leslie Johnstone receive their award from CSWA president Stephen Strauss. 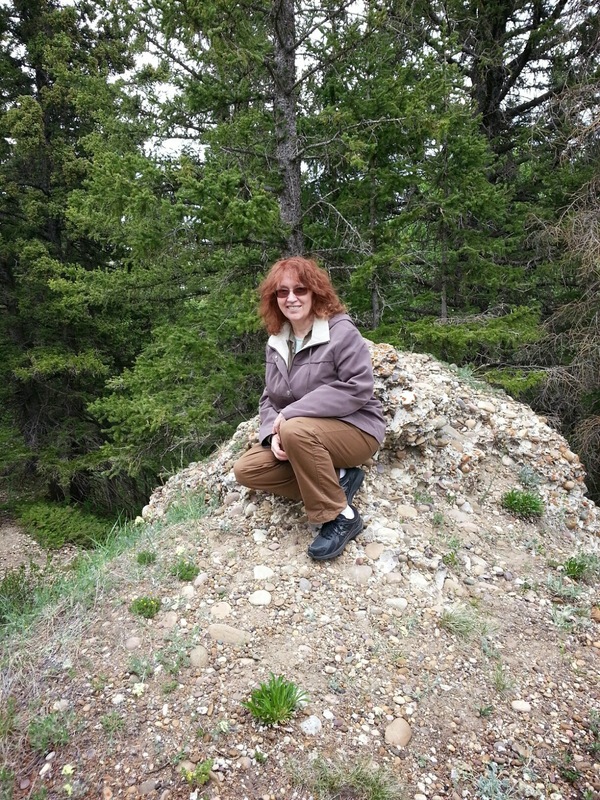 Victoria freelance writer Jude Isabella won the coveted Science Journalism award for her story "The Secret Lives of Bears" published in British Columbia Magazine's Fall/Winter 2013 issue. Jude, former editor of YesMag, the late lamented Canadian children's science magazine, was part of the group that launched Sci/Why. You can read her prize-winning article here and you can even see the scientists at work in this short video. 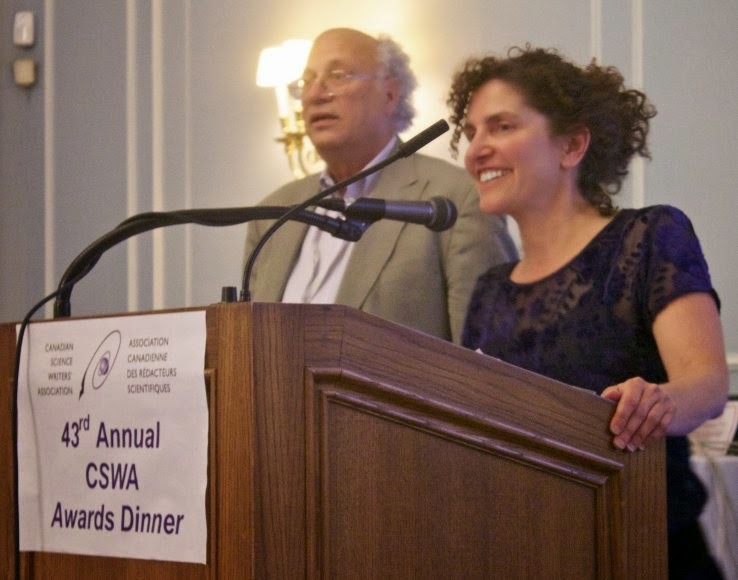 Jude Isabella thanks the CSWA, while Association president Stephen Strauss looks on. 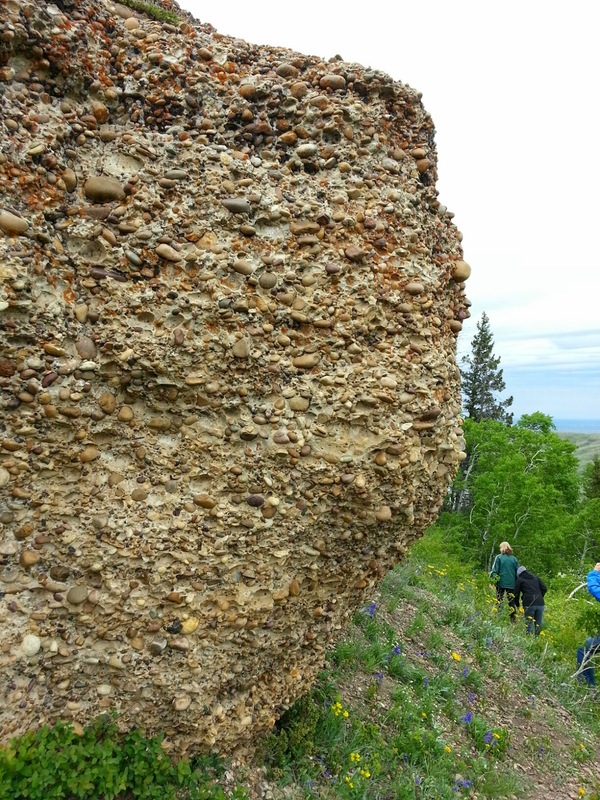 Rockhounds will find a rare treat in the Cypress Hills Interprovincial Park, spanning Alberta and Saskatchewan: the Conglomerate Cliffs. Cypress Hills covers about 2,600 square kilometres (1000 square miles), reaching altitudes of about 1,400 metres (4,500 ft). The formation was created when glaciers pushed the surrounding terrain up. 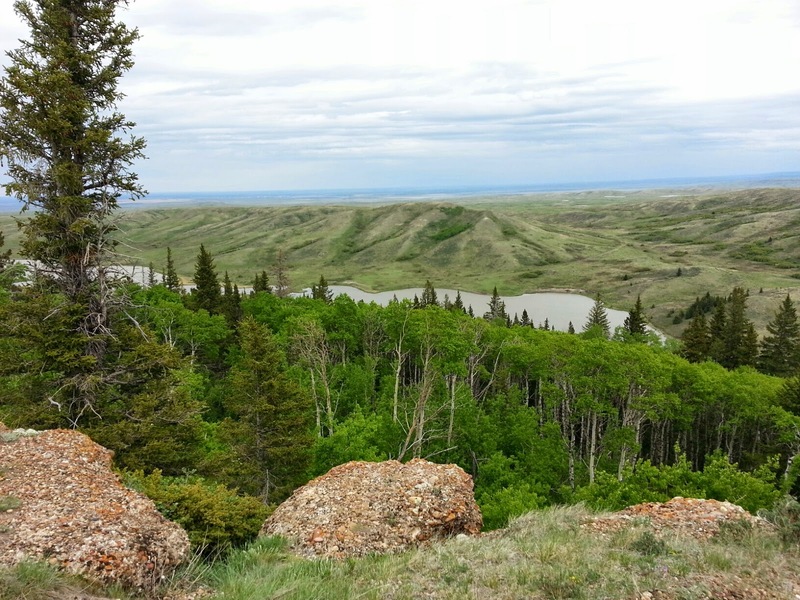 It's known to be less effected by erosion than the surrounding plain, and about 200 sq km (80 sq mi) on the Alberta side was also left untouched by glacial erosion. On a recent visit to the park, I had the chance to explore the Conglomerate Cliffs, a unique area looking down some 30 m to Adams Lake. 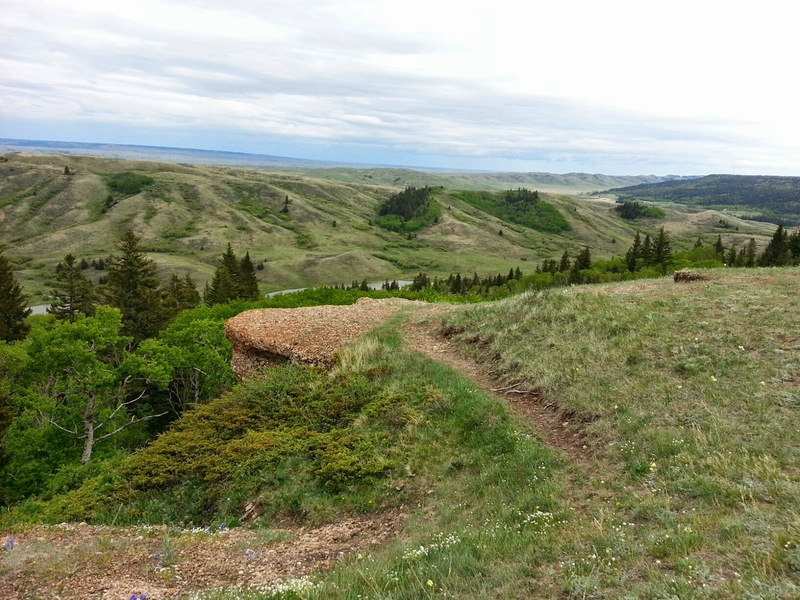 This area is located a short drive from the Fort Walsh Historical Site. 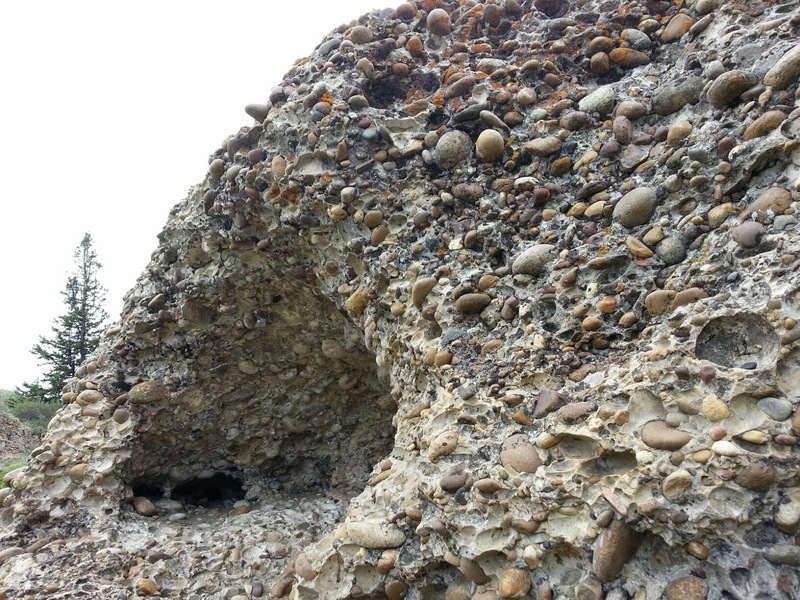 The surface of the Conglomerate Cliffs is made up of a combination of gravel and stones known as "cobbles." Water drains from the cliff edge, creating calcium carbonate, according to some sources, and with enough geological pressure it cemented this material together to form the cliffs. 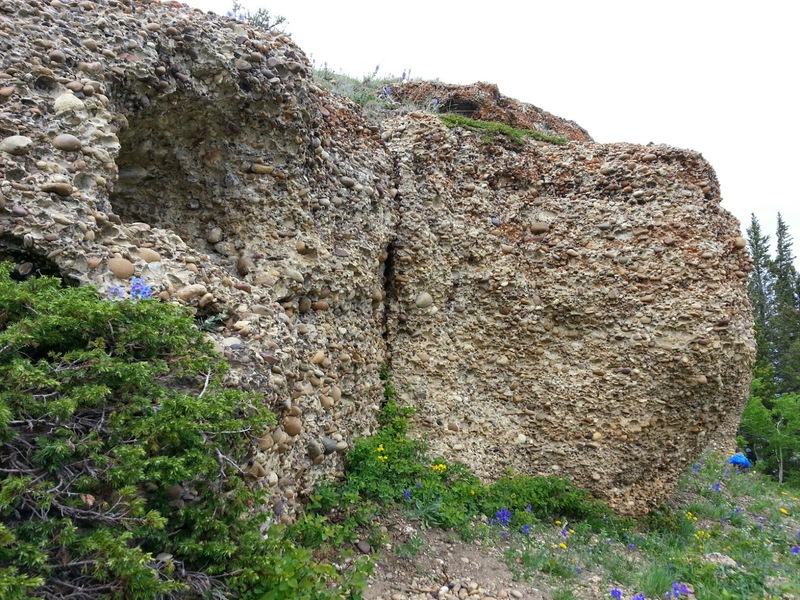 In turn, this conglomerate material resists erosion by wind or water, protecting the softer rock formations underneath and preventing the cliffs from eroding. It's well worth exploring the footpath leading down from the cliffs for interesting and unexpected details, like this rock "cave." 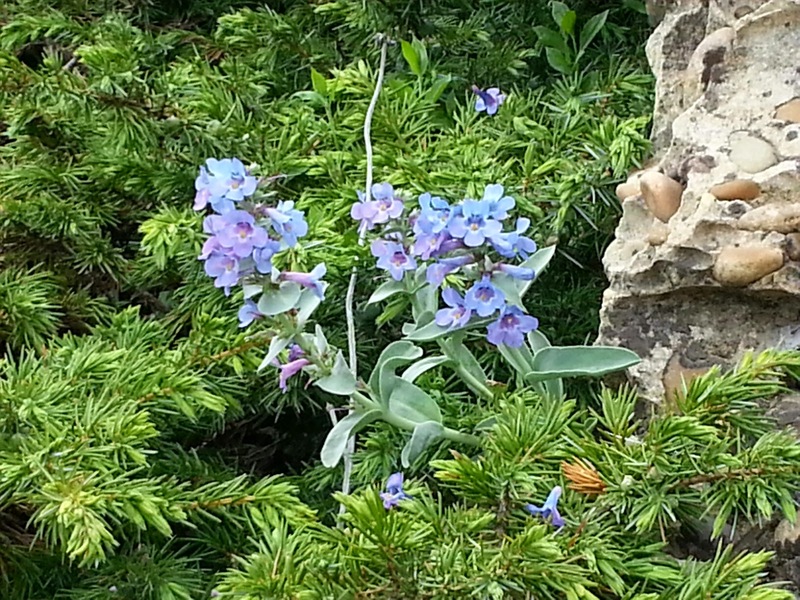 As well, a variety of flowers and some 220 species of birds can be found in the park. Here are some of the sights along the path. Marie Powell is the author of 15 books for children, including Dragonflies are Amazing (Scholastic Canada) and a six-book Word Families series (Amicus Publishing). Her second six-book series is expected this fall, along with two middle-grade books of Canadian history.